Harry Potter fans! This candle can tell you your Hogwarts house | SHEmazing! Many of us were left dismayed when we turned 11 and didn't receive a Hogwarts letter, knowing that we would never have the experience of being sorted into a Hogwarts house. If this was you, luck is finally on your side, because this HP themed candle is going viral on Instagram, and for all the right reasons. 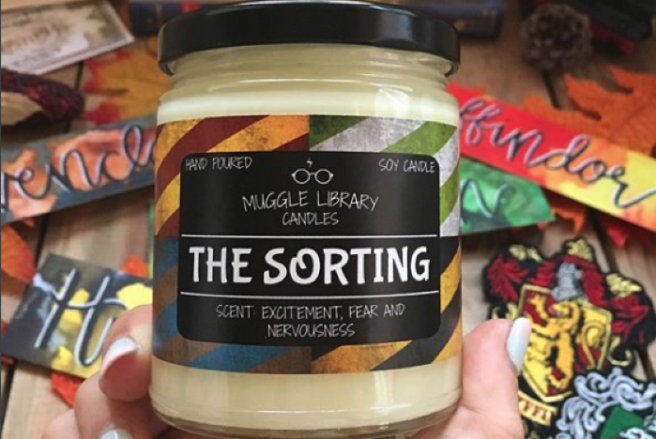 Created by Etsy shop Muggle Library Candles, their innovative Sorting Hat candle is telling us exactly which house we are most suited to. The candle starts off white and as it burns, it magically (or just physically) reveals what house you belong in. As the soy wax melts, the candle turns red, blue, yellow or green to represent the Hogwarts houses of Gryffindor, Hufflepuff, Ravenclaw and Slytherin. According to the scent notes, the whimsical candle has a lemony scent mixed with a musky combination of sandalwood, creamy vanilla, and patchouli. Or, as described on the label, 'excitement, fear and nervousness.' Sounds interesting. As well as creating this magical candle, Muggle Library Candles creates a whole host of other HP themed wax works. Flavours of candle include Parseltongue, Pumpkin Juice, Free Elf and Forbidden Forest. We'll be stocking up in time for our next Harry Potter binge watching session.